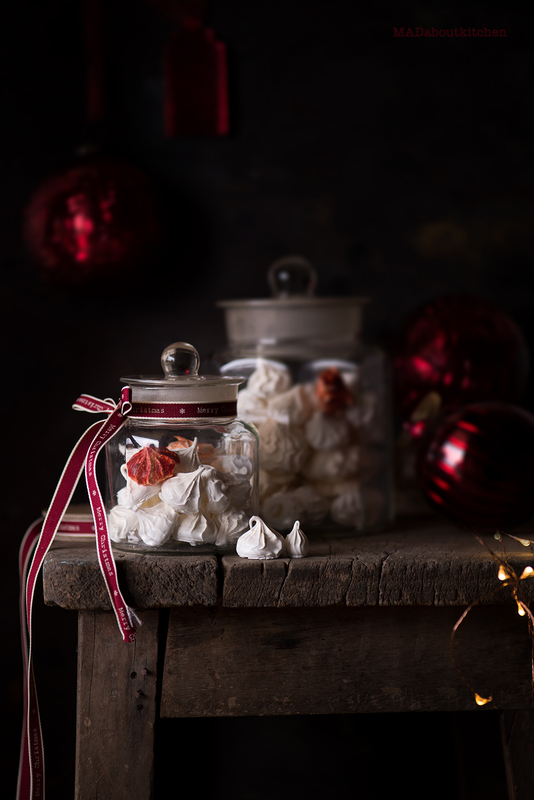 Meringue Kisses are cute little dombs, airy and light dessert made using egg whites and sugar. 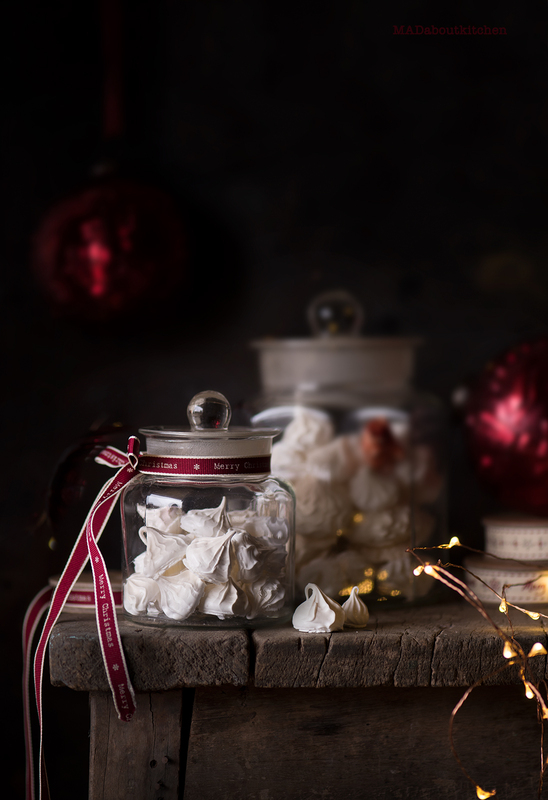 Meringue Kisses makes the perfect gift for any occasion. 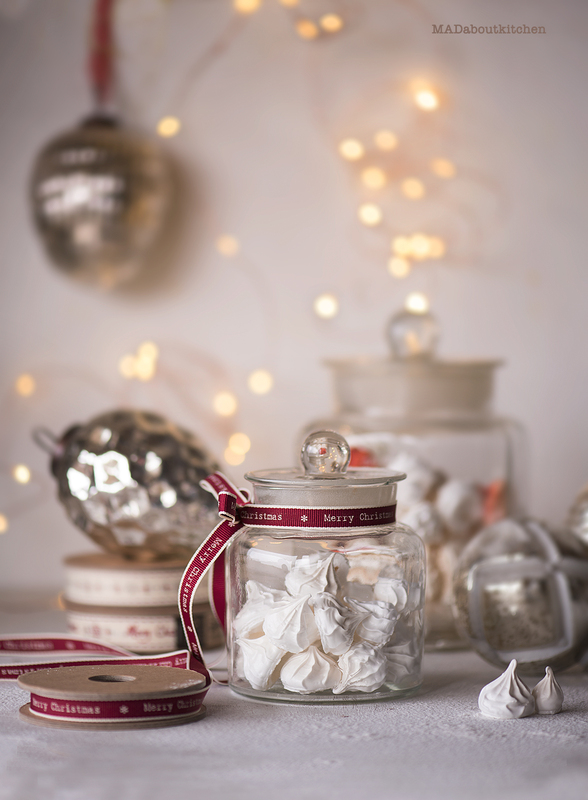 I had made jars of Meringue Kisses as return gifts for my son’s birthday and now for Christmas. They are always a hit among kids and adults. Meringue Kisses, can take deserts to an other level. I had amazing fun making them and just kept making batch after batch. 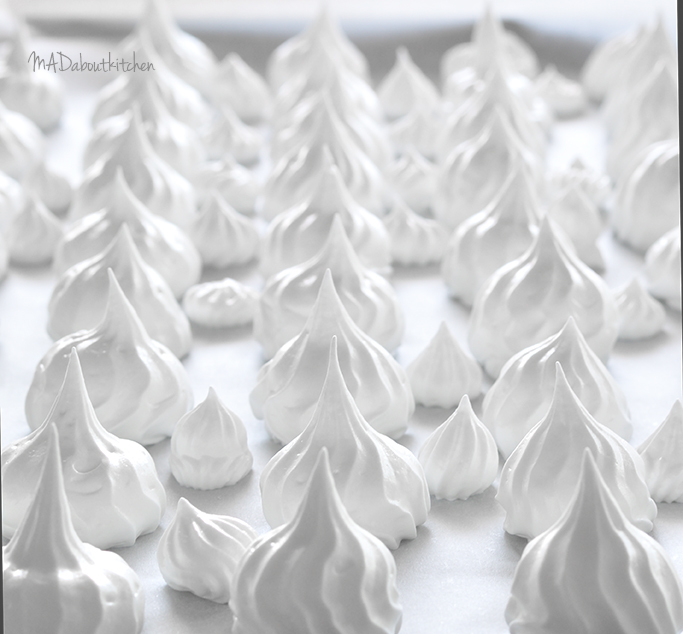 These meringues after baked just melts in your mouth. They are light and airy. It is a little too sweet for my taste but when plated with cakes it works well. Kids love them as is, dipped in chocolate or with fruits. Preheat the oven to 110ºC.Line 3 large baking trays with baking parchment. Seperate the eggwhites one by one. Make sure the yolk , not even a bit falls into the white. I seperate one by one into a separate small bowl and transfer it into the large bowl. This way I will not have to waste all the whites incase the yolk breaks. Place the egg whites, vanilla and sugar in a heatproof bowl over a saucepan of simmering water. Make sure the bowl is clean and dry. Make sure the water does not touch the bottom of the glass bowl. This is kind of double boiling is known as ‘Bain-Marie’. Beat until sugar melts. This should take just a minute or two. Remove from heat and using a electric blender beat the mixture for 15 minutes till the egg mixture triples and is white, stiff and silky. Equally divide the mixture between small bowls and add a little of one coloured gel to each mixture. Carefully and gently fold in using a large metal spoon, to make different coloured meringue mixtures. Working on one coloured meringue at a time, put into a large piping bag fitted with a 1cm plain nozzle and pipe 4-5cm mounds onto the prepared baking trays. 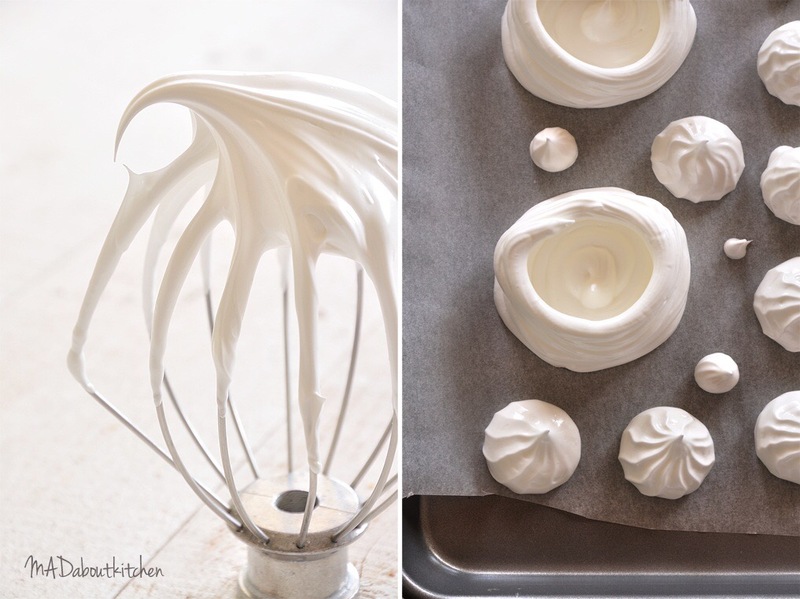 For pipping and to get a sharp domb, pipe the meringue, stop and pull it vertically at 90°. This will give a pointed domb. At this point you can sprinkle some cocoa powder, instant coffee powder or some powdered colour on the dombs for some variation. Repeat with the remaining meringue mixtures to end up with approximately 50 mini meringues. Bake in the oven for about 1.5hour until the meringues are crisp on the outside, but not browned – prop the oven door open slightly if they start to colour. 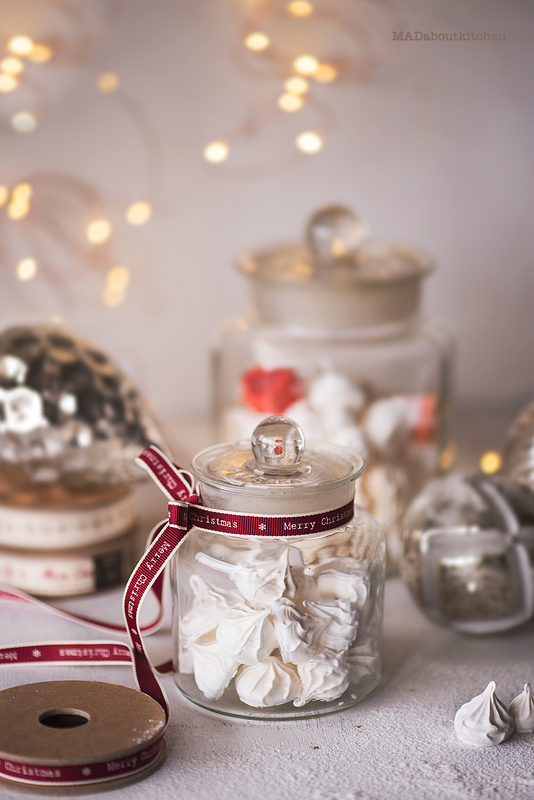 Peel them off the paper and cool on the baking trays for a minute and immediately store them in an air tight container in a cool and dry place. You can make Pavalova, Meringue Cups with the same recipe. *Incase you can not bake all of it one go, pipe them on baking paper n let it sit outside. This will not affect the meringues. *As soon as you take it out of the oven place them in airtight box. Keep them away from humid areas. Store it in cool dry place. * The glass bowl that you use to whip egg whites has to be clean and dry. *As soon as the merigues are out of the oven, cool it for just a minute. Layer them in between baking paper and store them in airtight box. Store in a cool dry place. If left out, the meringue will start getting sticky. Thank you Shanthini 🙂 How did it turn out? ?